With great restaurants launching seemingly every time you blink, it can be difficult to break out from the crowd - but Faith and Flower does it with a smart mix of talent in the bar and kitchen, elegant yet accessible ambiance, and a post meal beverage program that takes the experience beyond dinner, that thing you do before finding your entertainment for the evening, to the main attraction in itself. 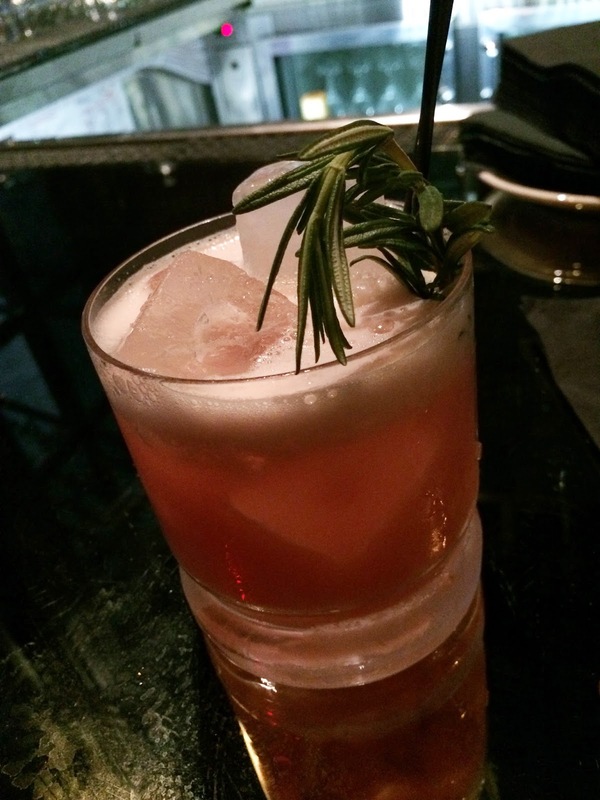 Just as the restaurant name and concept references crossing of two eras: 1920s and modern day downtown LA (via the name of the street it's on, at those points in time) - the bar program also features craft cocktails inspired by the Roaring Twenties as well as more recent signature creations. We loved the counter seating that is conducive to quick bites with drinks whether solo or with a group (there is also a communal table in the bar area). I had been pre-alerted to the amazing English Milk Punch, but apparently this takes so much preparation, it is only served in limited amounts per day and they were already sold out the night of our visit. But Mixologist Mike Lay was a great host, who guided us through the rest of his drink menu. We loved the light and delicious Ben Hur ($12) with Buffalo Trace bourbon, lemon, apricot marmalade, egg white, F&F aromatic bitters as well as the Oxford ($14) with Pierre Ferrand 1840, Denizen & Appleton ruma, Cloroso sherry, Capillaire syrup, orange shrub. Both used fresh juices that made them taste like they are good for you. Yes, craft cocktails are a favorite way to get at least some amount of fruit in our system. Loved that the twenties meets modern day concept carries through the beautiful decor in the dining room. Down to details like a formation of vintage hand mirrors, that you could imagine came from dressing rooms of Golden Era Hollywood, made to resemble leaves on a tree. And the menu that comes in a classy bound book embossed with the F&F logo. The ambiance is transportive, but we fell even more in love with the place once the food started to arrive. First up: NY Steak Tartare ($14) uni, miso cream, black sesame. This is one of those dishes that combines ingredients you wouldn't often see together, but that make so much sense once you taste it that you wonder why you haven't encountered it already. Regular readers know my obsession with sea urchin, so yes, I may be a bit biased as they 'had me at uni'. But, this truly was surf and turf at its best: raw glorious deliciousness. The steak is perfectly fatty, tender, lusciously smooth, with its natural flavors enhanced by the umami of miso and texture made cohesive with cream. The plump tongues of uni lent rich, creamy, briny ocean funk, while tiny squares of seaweed and flakes of bonito provided contrasting levity. All this is served up with round crisps perfumed with fragrant black sesame. One of the best preparations of steak tartare I've had in LA and one that I definitely wake up craving and need to go back for, soon. I had also been excited about the Uni Toast, but that wasn't available on the night, so we tried the Dungeness Crab Toast ($15) instead, with jicama, pickled sea beans, green goddess aioli. Loved how the tartness of the pickled sea beans, and an unnamed source of subtle heat punched up the mild flavors of the fresh and generous chunks of crab. 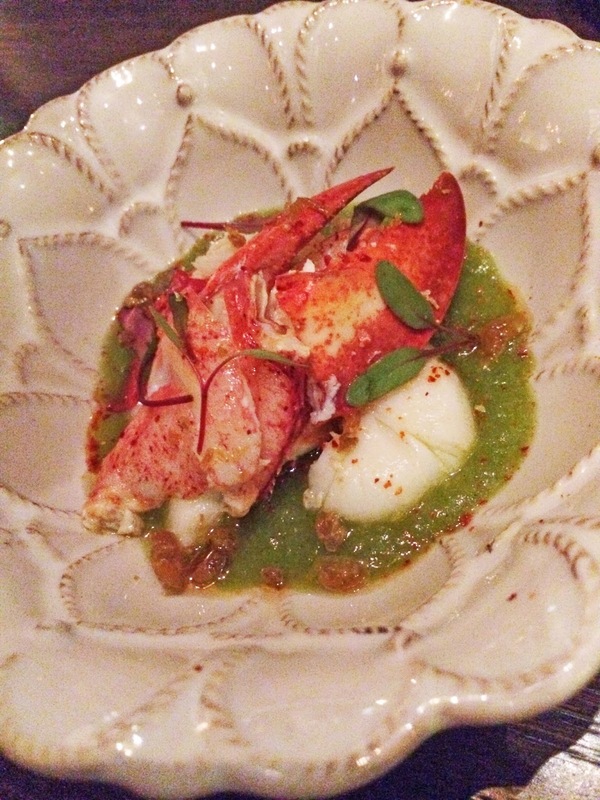 My friend was in the mood for lobstah, so we also tried the Chilled Maine Lobster ($19) with cucumber, lemongrass gazpacho, a refreshing dish that also served as palate cleanser before we headed into main course territory. Whenever I see quail on the menu, I almost always have to get it. And the Mushroom Stuffed Quail ($25) would be roasted in the wood oven, and served with madeira mushroom sauce. We actually wanted the portions to be smaller on this one though in order to maintain the juiciness of the meat and crispness of skin. To us the texture was the equivalent of white meat chicken. Loved the sauce though, which was wonderfully infused with rich wine flavor, delicious meat juices, and well balanced with savory, sweet, with subtle acidity. Our friendly server, Asha, did recommend a vegetable side, which we ended up loving: Warm English Peas and Gold Beets ($8) sheep's milk smoked ricotta. I don't recall having had anyone else pairing peas and beets, but the savory softness balanced beautifully with the slight crunch of subtly sweet beets and creamy smokiness of the sheep's milk ricotta. Then came the dish that's been drawing rave reviews across the board: Oxtail Agnolotti ($17) bone marrow butter, tangerine salsa, beef tendon chicharrones. The previous dishes showed creativity, but this one was sheer genius. With the roster of talent in the kitchen, and their Michelin-starred cred, it shouldn't be a surprise that a plate of this level would be produced - but it was on the whole revelatory: the bright citrus (I'd never seen used with pasta!) sent bursts of sweet and tart through the pillowy pasta packets, packed with flavorful tender oxtail, punctuated nicely by the crisp crunch of chicharrones strewn throughout. And that the chicharrones were made of beef tendon vs the typical pork skin, giving it a denser, less airy consistency I thought helped it retain its crispiness against the sauce and juicy citrus pieces. Then there was the bone marrow butter: pleasing, decadent globs of fatty meaty goodness, little treasures to be discovered among the other ingredients on the plate. Brilliant, and instantly addictive. The second time I went back to F&F, this was the first thing I had to get. Do NOT leave Faith and Flower without eating at least one plate of this. For dessert: Pistachio Feuilletine ($8) cheesecake puree, grapefruit 'confit', grapefruit sorbet. For some reason I pictured the cheesecake puree playing a supportive role, but instead it was the main feature: beautifully piped and plated. Unfortunately we were not fans of the dense (the puree was more like thick frosting) on only slightly less dense but still rich sweet grapefruit 'confit'. But the grapefruit sorbet was bright and enjoyable. We also got to try the Milk Chocolate Cremeux ($8) peanut butter crumble, Big Sur sea salt and caramel ice cream - which we enjoyed. Made sure to get a bit of every element in each spoonful for full effect. The food is already outstanding, but the post meal drink helps define an experience at F&F as dining/entertainment in one: F&F offers a number of absinthe experiences. The one we tried was Absinthe 'Leap of Faith' ($20), which definitely wins award for Best Drama, right at our table. First, Asha lined up a bottle of La Fee, a Listerine-blue/green colored absinthe, with containers of straws and matches. She proceeds to pour some of the absinthe into a snifter, lights a match and ignites the liquid. Out shoots blue flame, which reminded me for some reason of a Patronus (yes, big Harry Potter geek over here, and this analogy before I even had a taste of the famed, allegedly hallucinogenic in some forms, spirit). A seahorse. Patronus. As in, force for good. The flames are then poured into a waiting tumbler of root beer. A cloth napkin is swiftly placed over the opening of the original glass, which is turned over, trapping the smoke. Asha then instructed us to stick our straws into the overturned glass, inhale a puff of absinthe vapor, hold it in for a beat, then take a swig from the tumbler. Tip: don't make the same mistake I did of thinking you had to inhale the smoke down to the bottom of your lungs. Just take a shallow breath. Holding in the smoke is said to help open up your air passages, the better to allow the liquid absinthe root beer mix to travel quickly and release its flavors to maximum effect. The taste is actually better than any other absinthe that I can remember - still lots of anise fragrance and flavor, but much less intense and much more drinkable. For those who have never tried absinthe and worry about its storied history - this is safe, legal, restaurant bar grade absinthe. You're not going to hallucinate, or end up in the ER. All in great fun, and I say something that makes F&F even more of a destination. This would definitely make your meal an unforgettable one. If you are lucky enough to have a budget for large groups, there's a gorgeous private room at the back of the restaurant which ups the opulence of 1920s decor. If I ever win the lottery, this is where I'd host the celebration. Before I got down to recap my first meal, I already had occasion to return to F&F thanks to @conbon's birthday! 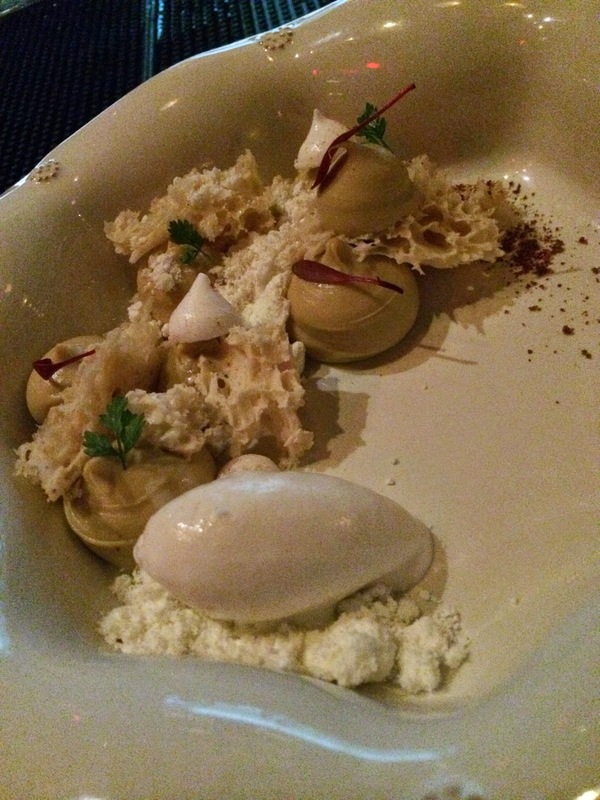 The first: Stumptown Coffee Creme ($8) with almond sponge, star anise meringue and coconut sorbet: loved the interplay of rich/light flavors and creamy, spongy (hand torn, fluffy cake) and crunchy (meringue) textures here. The Hazelnut Chocolate ($8) 'Les Gianduja' chocolate mousse, hazelnut sabayon was also outstanding, like a giant chocolate truffle with a crunchy pie-crust-like-bottom. We also had our fill of cocktails, of course, of which Vaudeville ($12) with Square One Botanical vodka, lemon, raspberry gum, F&F aromatic bitters, rosemary, Italian merengue was a favorite for its light, refreshing and nuanced sweet/tart/bitter/herbaceous taste. And no birthday celebration, or visit to F&F, for that matter - would be complete without absinthe for the grand finale (see cool shot of this second round at the bar via @conbon's Instagram here). Can't wait for the next time I get to go back to F&F: I already know what I need to order. *Disclaimer: The first meal mentioned was hosted. Look for reservations (and OpenTable points!) here. In that infamous experiment, physiologist Ivan Pavlov found that dogs, naturally salivating in anticipation of food, can be conditioned to react the same way to the sound of a bell, if trained to associate the ringing noise with food. Recently, I discovered Vegas is my bell, and the seafood/Combo Pan Roast at Oyster Bar my unconditioned stimulus. The mere mention of the city triggers thoughts of that almost-traffic-cone-colored-bowl-of-pure-delicious, and sets off unseemly drooling. Even though everything about that place is all wrong. With the exception of its incredible food/cocktail offerings, I hate everything that Vegas is. The arid desert weather, the perpetual blanket of smoke that sits over every public indoor space, the constant barrage of light and sound, signifying nothing (but the most futile of dreams) trapped in claustrophobic bullet time. Especially seedy old school Vegas, with its worn carpets, dense with decades of cigarette and alcohol fueled footfall; its wrinkled old souls, feeding their lifeblood into the slot machine, who look like they will need to be surgically removed from it when they reach the end of their days. And Palace Station, home to Oyster Bar, is off-off-strip, and probably one of the most OG casinos left standing. When foodie blogger friends first recommended this place, I honestly thought they were out of their minds. Though off-strip, cozy authentic eateries are often the ones that offer the most amazing food...this was the kind of place where you would expect the $2.99 casino buffet - a fueling pit that is all utilitarian quantity, not quality. And then they mentioned the place was basically a counter, 18 seats, no reservations - and the wait could be between one to three hours. If we're lucky, and go during off-peak time. Well, don't judge an oyster bar by its location - because this turned out to be one of my favorite places to eat in Vegas (see Pavlovian response). There is indeed without fail, a long line snaking from this place at all hours - for good reason. Their pan roasts, made fresh to order by snarky-funnyman chef Bob, are pretty damn amazing. What is pan roast? It's your choice of seafood, roasted fresh in a cauldron/pan with a slot-machine-like-handle, with brandy, cream and tomato. You also get to choose the level of spiciness: from 1 to 10, with 10 so extreme that even the chef discourages most people from ordering it. They do take 'made to order' very seriously, and it takes a while to get it to just the right (roiling) temperature and consistency. Many customers order a platter from the raw bar to relieve hunger pains until your pan roast is deemed ready by the chef. I went 1/2 for my half dozen ($12.99), since not many places serve clams raw and I really wanted to try it. Neither the clams nor the oysters had the spring of the freshest catch, nor that neat, perfectly chilled brine that conjures deep ocean - but Water Grill this never tried to be, and when you've been waiting in line for hours, you start to appreciate any bite of food you can shovel in to stop your stomach from consuming itself while you await the main course. And then came my Combo Pan Roast ($21.99). Packed with lobster, crab and shrimp. Immersed in rich brandy tomato cream sauce that has that irresistible tug on my tastebuds, that happens it seems whenever alcohol is used in cooking, leaving me lapping for more. While the pan roast initially may seem pricey for this essentially 'seafood shack' style Cajun joint, the pieces of seafood are a healthy size, snappy-fresh, and there's lots of it in each gigantic lake of a bowl. Most people (i.e. averaged sized Asians, in our group) would either be able to share a bowl between two people, or have enough leftovers for your next meal. Since that first time, every time I go back to Vegas I must now stop at Oyster Bar. (Beyond the food, there is a lovely instant camaraderie between those 'in the know' and lots of bonding / commisserating while in line and at the counter that provides nice human moments while in sin city.) While there are other tasty sounding Cajun dishes on the menu from gumbo to jambalaya: I can't imagine not getting the pan roast. Because I know that the minute I've settled the bill, no matter how stuffed I am or if my arms are already filled with to go containers, I already wish I had ordered more. And next time someone says 'Vegas', I will be right back at Oyster Bar, without question. Yellow Cow: A Happy Surprise KBBQ Hotspot in the South Bay !!! When you've lived long enough, you realize that not all surprises are of the pleasant sort. (Cue violins). It's so easy to become cynical. Even with food. And when an invite to try a Korean BBQ spot, way out in Gardena, arrived in my inbox, I was...skeptical. Especially when Ktown, with its treasure trove of mouthwatering and affordable korean eateries, is so accessible on an everyday basis. Especially at the part where there was mention of "combo #1"...which immediately brings to mind "quick service restaurant". But then scuba class brought us to the South Bay, so we decided to give Yellow Cow a try. A small, cozy space in a non-descript strip mall was actually the first sign that we might love this place. And owner Monica, a Korean mom who opened the restaurant 13 years ago, when her kids were young - and named the place after their favorite animal, plus the cheeriest color. Who, in a sight unfamiliar to non-Korean diners in Korean restaurants: gregariously flits around the dining room like a mother hen, making sure everyone was being fed well, and having a good time. We were treated to a kaleidoscope of banchan as soon as we sat down. Monica explained that the banchan varies from day to day depending on what's fresh in market, or if inspiration strikes to do a certain special. We loved every item that we had that night. The picture heavy menu clearly caters to a community that may not be as familiar with more...ethnic cuisine. There were step-by-step instructions in English of how to enjoy a korean bbq meal. And first to appear on the list were set meals or the aforementioned "combo"s, presumably to make it easier for newbies to put appropriate dinners together. These combos mainly varied in the number of plates of proteins (choose from pre-set options) and all came with free rice cakes, steamed egg, steamed rice, and soju (or beer or soda) and of course the side dishes without which no korean meal would be complete. Monica kindly offered us combo #2 ($68), which comes with 2 Meats + 1 Seafood + 1 Soup + 2 drinks. Those used to AYCE meals in Ktown that average $25 per person might get a bit sticker shocked at first, but realize that $68 is for two people, with plentiful portions of quality ingredients that easily fed two average sized ladies past the point of satiation - plus alcohol. 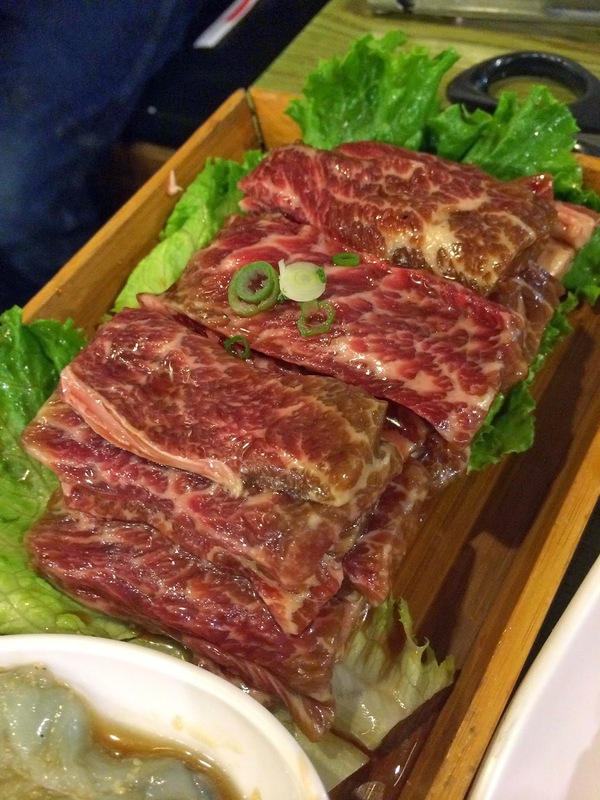 On that note, we started with the Kalbi ("Marinated Beef Ribs" on menu, requires supplement of $5) which came as beautifully marbled, hefty, tender, juicy slabs that we could cut up with a pair of scissors and grill ourselves. We loved this flavorful kalbi, toasted with our glasses of Hite beer. Then came items that you don't see on every KBBQ menu: kurobuta pork belly ("Black Pork Belly" on menu, requires supplement of $3), known for being super fatty, flavorful, juicy and tender. This also was presented as giant slabs of thick bacon strips, beautifully arranged on a wooden tray, that you get to cut up yourself so you can adjust to the size you want to grill. Also provided is a cross section of onion that you use to 'rest' the pork on the grill if the cooking speed is exceeding your face-stuffing speed. And if you were thinking that the protein offerings might be limited to what appeals to the masses: we just selected the heartier options as we were super hungry after scuba class - Yellow Cow actually features options for the more adventurous eater too, from beef tongue to intestines to tripe to duck breast. For the seafood item included in our combo: we selected shrimp, which wasn't spectacular, but still fairly tasty. Yellow Cow offers other items that you don't see everywhere either: there was the free side that comes with any combo, a plate of thinly sliced radish in two colors, with jalapenos, garlic cloves and a fermented bean paste. The pink radish slices were dyed with beet, while the white radish was flavored with vinegar and wasabi. You use the radish to wrap up meat that's hot off the grill, and stuff it with the jalapeno, garlic (grill it too to release flavor) and bean paste. The radish adds refreshing crunch that perfectly balances the smokey char and juiciness of the meat. We really loved this: and korean bbq may not feel right without it again! Of course, you can also put the meat on the mountain of slaw provided and pick some of that up with each bite of meat to add textural contrast while soaking up the lovely meaty juices. Every combo also comes with a side of Steamed Egg, which comes in a stone pot piping hot, a smooth and milder tasting side dish to balance out the bold flavors of the mains and other spiced-up sides. Lastly, also included in the combo meals is your choice of soup: Miso, Kimchi or Ramen. We went for the ramen, which came in a large kimchi chigae like, beautifully Day-Glo orange broth - enough to serve two. For the uninitiated, Yellow Cow has the very 'authentic'ally Korean device of the tabletop call button, which you can use to get service on demand. We never had to use this during our dinner though, as Monica and her team were so attentive. Aside from Combo #2, we also got to try Fried Dumplings (8pcs for $10) topped with a slaw of onion, cilantro and gochujang (pungent paste made primarily of chili, glutinous rice, fermented soybeans). To finish, we tried Monica's original creation: Seaweed pancake - fried with sesame leaf - delicious and one of our favs of the meal! All in all, the authentic korean barbecue, plus western style hospitality, plus bonus dishes showing creativity all make for a kind of surprise that also delights in Gardena. Would I drive out to Yellow Cow if I lived in Ktown? Probably not. But Yellow Cow is definitely a great place for those in the South Bay, craving good Korean food and not willing to drive up to Ktown. I know that if I ever find myself in the South Bay again and hungry for Korean, Yellow Cow would now be first to come to mind.